The size and shape of Japanese black pine is variable reaching a height of 25 feet and a spread of 20 to 35 feet in nature. 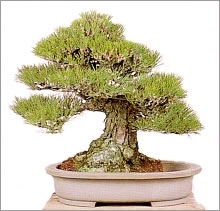 The Black pine is a native of Japan. 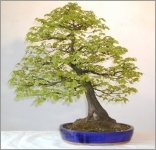 One of the most basic trees for bonsai, a very popular specimen. This is a dense spreading pine with horizontally branches and a broad pyramidal head. Pinus thunbergii has thick, dark grey-green needles, 2 in a bundle. Though quite long, the needle-size can be reduced in length with the use of bonsai pruning techniques. Branches are held horizontally in a picturesque silhouette and sometimes can outgrow the central leader forming an attractive multistemmed specimen tree. Bark is purplish-grey and becomes very craggy and fissured with age. Branch pruning can be done in late Fall or Winter to reduce sap bleeding from the wound. You might consider removing major branches in Spring as the large wound will heal faster. Pines should be reduced slowly, over a period of years. Drastic pruning is stressful and should only be performed on very strong and well-fed trees. Keep recently pruned trees out of temperature extremes and in partial shade for 2 to 4 weeks.